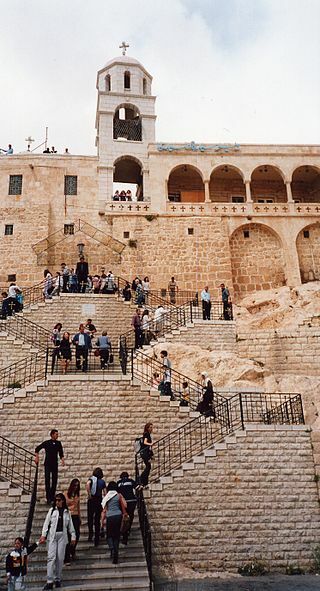 Outside of Palestine one of the most famous sanctuaries of the Mother of God in the Levant is a convent of Orthodox nuns, - Dair as-Sagura, located within the walls of an ancient fortress on a hill near Damascus. It is thought to be the site where Abel, the murdered brother of Cain, is buried, and is also the site of one of the world’s most ancient monasteries. Saidnaya, (or Saydnaya or Sednaya), is a city located in a mountainous region of Syria about 17 miles north of Damascus. The word Saidnaya means “Our Lady,” and refers to a famous icon of the Virgin Mother of God that is still kept in the main church. The origin of the shrine of Our Lady of Saideneida goes back to a time long before the separation of the Orthodox Church from Old Rome. In fact, there is a tradition that associates the shrine to at least the time of the Roman Emperor Justinian I (d565). According to this tradition, the Roman Emperor Justininian I was leading his army through the desert in modern day Syria. His army was suffering greatly from a lack of water and was near despair when the emperor saw a beautiful gazelle in the distance. Justinian chased the animal, which came to a rocky knoll where there was a spring of fresh water. He was preparing to shoot the animal when it suddenly transformed into an icon of the Theotokos which shone with a heavenly light. A voice could be heard to say, “No, thou shalt not kill me, Justinian, but thou shalt build a church for me here on this hill.” The light then faded, and the beautiful figure disappeared. The water from the spring saved his army, and Justinian told his commanders what he had seen. He ordered them to draw up the plans for the church Our Lady had requested. The architects complained of insurmountable problems, and the Blessed Virgin appeared to the emperor in a dream and gave him the plan for the church and convent, of which she herself would be the protectress. The project was completed on the feast of Our Lady’s nativity. Once constructed, the convent became so renowned that it was second only to Jerusalem as a site of pilgrimage. The icon, called Our Lady of Saideneida and attributed to St. Luke, was said to have been brought to its home in the year 870 from Jerusalem. The holy abbess of the convent, a woman named Marina, spoke to a Greek pilgrim named Theodore who had stopped at the convent for rest on his pilgrimage to the Holy Land. Since he was on his way to Jerusalem, the holy abbess Marina asked Theodore to purchase an icon of the Blessed Virgin in the Holy City and bring it back to the convent. Theodore turned back and purchased a beautiful icon of the Theotokos that he knew would be acceptable to the abbess. His journey back to the convent was fraught with difficulties, as he and his companions were set upon by bandits and suffered the attack of wild beasts. The hermit turned to the Blessed Virgin in all these dangers, invoking her intercession as he prayed before the icon. Despite all the attacks and violence, all those in the caravan were miraculously saved from every danger through the aid of the Mother of God. The hermit Theodore was convinced of the powerful aid of the icon, and was tempted to keep it for himself. He decided to return home by another route to avoid the abbess and Saideneida completely. He paid to take ship, but the vessel encountered such a furious storm that they were forced to turn back rather than be lost. Repenting of his error, he returned to the road he had taken and made his way back to Saideneida. Once back at the convent, the days passed and he found that he did not want to part with the icon. He lied to the abyss, telling her he had not purchased the icon she had requested, and planned to depart from the convent in secret rather than face the disappointed abyss again. Moving in the darkness the following morning, the hermit made his way soundlessly to the gate so as to begin his trek back to his homeland. As he attempted to pass through the convent gate, however, there was an invisible power that would not allow him to pass. It was as if he were trying to walk through a wall of solid stone, though nothing could be seen that barred his way. When he realized that he would not be able to leave the convent, he turned back and faced the abbess, admitting to her that he had lied and had intended to keep the icon for himself. With tears of gratitude, the abyss Marina gave glory to God and His Holy Mother and the icon found its home. That same icon, known as the Shaghoura, meaning “the illustrious,” is kept in a pilgrimage shrine that is separate from the rest of the chapel. It is hidden in an ornate niche with silver doors. Childless couples especially, and pilgrims seeking miracles of healing still come seeking the Blessed Virgin’s intercession. The shrine was formerly well known in the West, where from about 1200 it was popularized by the stories of miracles and miraculous healings that were related of the veneration of the image. A German chronicler, during the ages of the crusades, wrote of his pilgrimage to the convent and spoke of the special properties of a miraculous, holy oil that was emitted from the icon. It was believed that the oil could cure the sick, and Templar knights, especially, would go to the shrine to obtain the holy oil for their churches. Interestingly, not only Catholics, but also Moslems go to the shrine as pilgrims. It is remembered that a sultan, in thanksgiving for a prayer answered through the icon, set a lamp to burn perpetually before the image of Our Lady. The Middle Ages were certainly a time of faith, and there were many images of Our Lord, the Blessed Virgin, and various saints that were produced for the edification of the people. 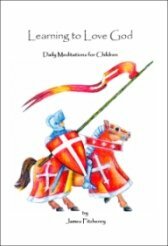 Inflamed with a true zeal for the faith, and anxious to give glory to God, there were many shrines all over Europe, many of which are now long forgotten in our age when the world struggles mightily to extinguish the light of Christ.